Saturday- We had a quiet day at the resort. We did the laundry. I worked on articles, we walked, rode bikes, sat outside reading and generally had a nice day. We went to Temecula to the Costco for gas and to visit the Old Town Farmers Market. It was a nice market and we bought some tamales and oranges. The strawberries looked awesome, but we would not have eaten them this week.! Sunday- We left the resort around 9:30 and zig zagged from the resort out to I 215 south. 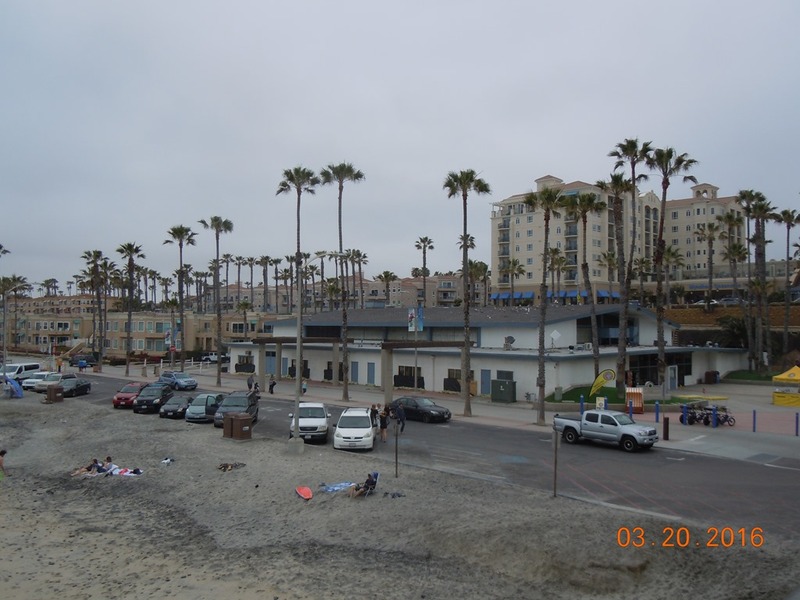 We drove southwest to Hwy 72, which took us to Oceanside CA. We stopped by the Elks Lodge to check out their RV park. It was basically a dirt parking lot with hook-ups. We might stay there sometime in the future. 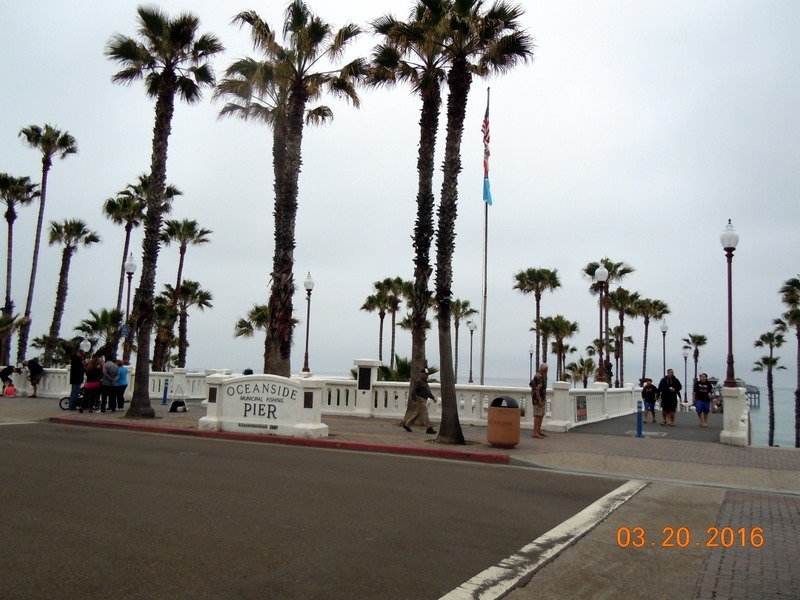 We drove over to the Oceanside Pier, easily found parking, and walked out onto the pier. The area reminded me of Venice CA, where we had ridden out bikes in 2012-13, Except there was no amusement park on the pier like there was on the Santa Monica pier. Notice above that the buildings are right at ocean level. They keep talking about the “big one” earthquake and how many people will perish from the Tidal Waves. With these gorgeous condos on the beach, you can clearly see why. 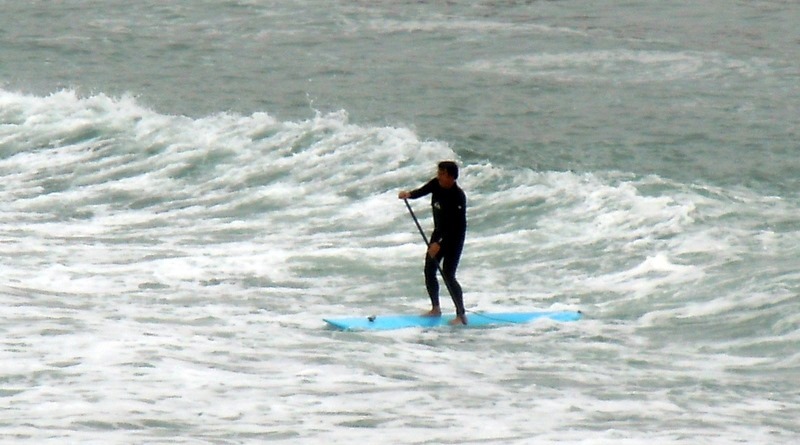 Below, the black dots are surfers. 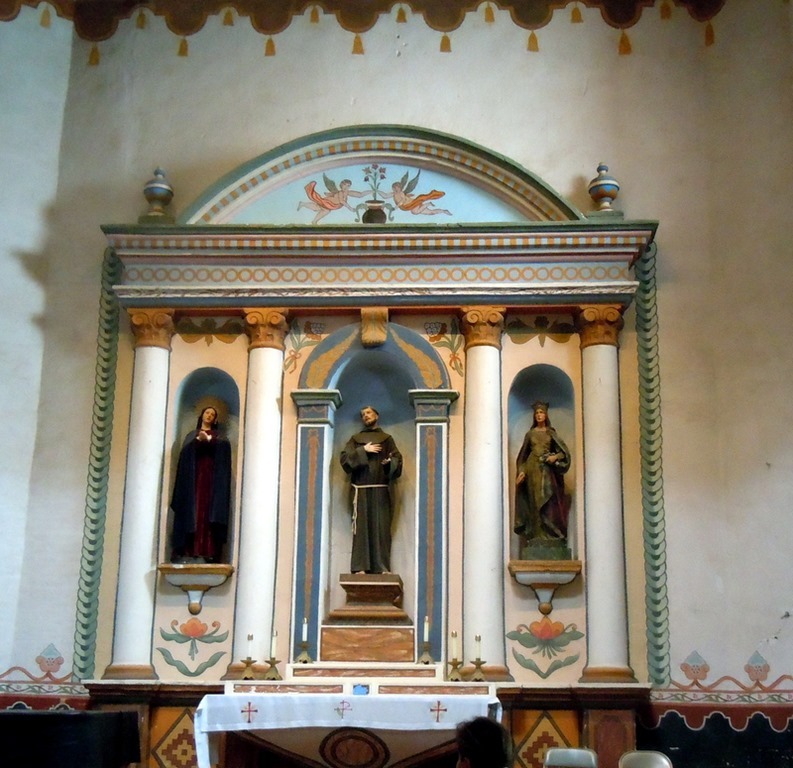 We left and drove north on Pacific Drive until it ended then we went to Mission San Luis Ray de Francia. 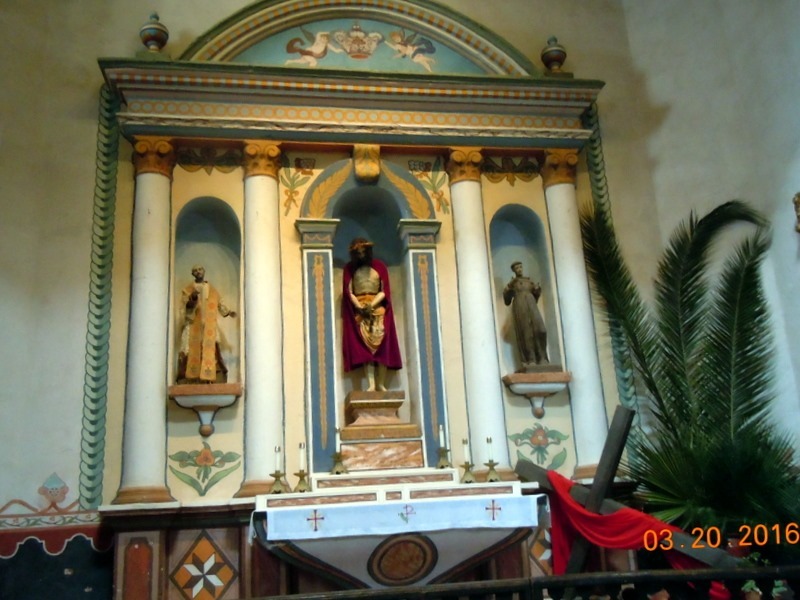 It was Palm Sunday, so of course the church was very busy. 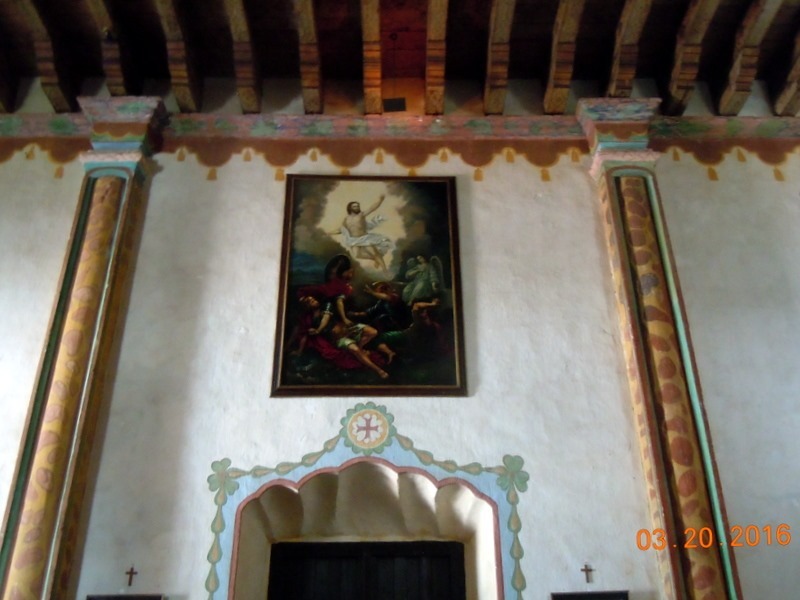 The service was not held in the Mission church, it was held in another church on the property. Just as we were arriving, Mass let out, so we easily found parking. We went in to view the Mission. 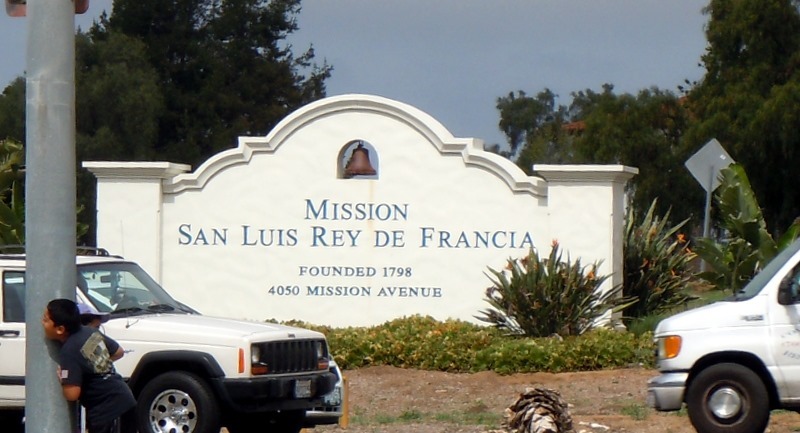 “Founded in 1798 by Padre Fermin Francisco de Lasuen, the Mission was named after St. Louis IX, King of France, who lived during the 13th century. 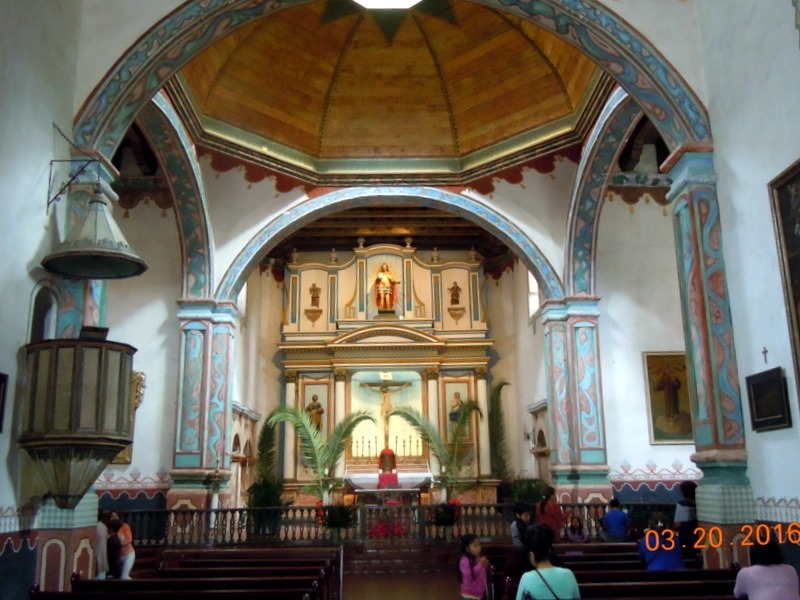 The history of the San Luis Rey area reflects five periods of occupation: Luiseno Indian, Spanish Mission, Mexican Secularization, American Military, and Twentieth Century Restoration. 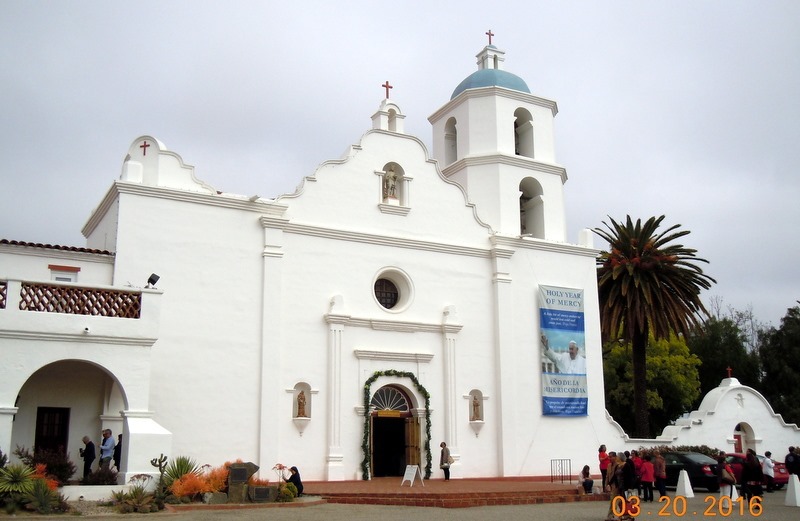 Because of its large size the mission has been nicknamed "King of the Missions." “ From their website. 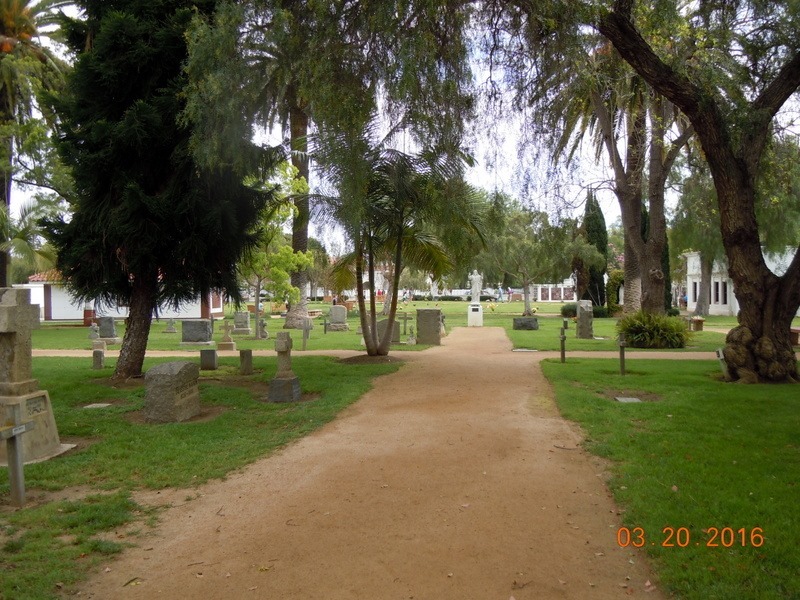 The cemetery is the oldest in San Diego county that has been in continuous use. 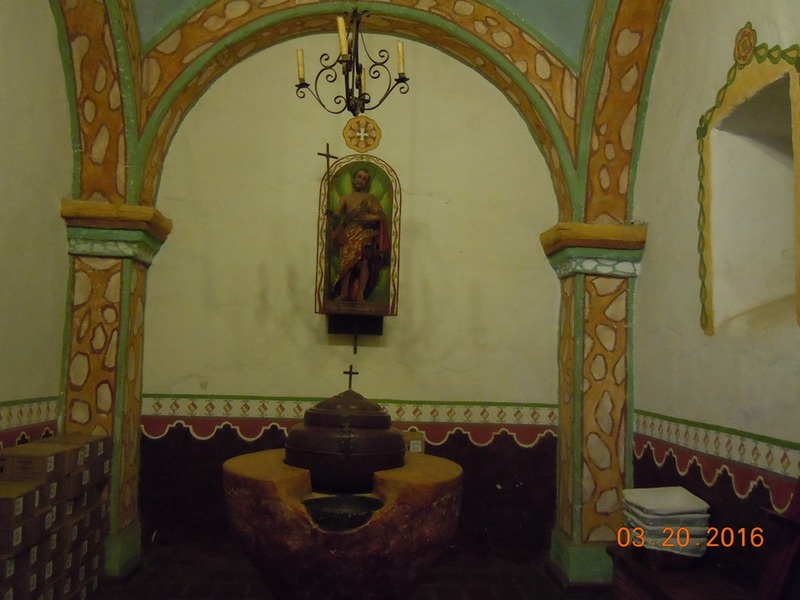 The crypt holds the Monks, and the last one interred was in 2010. We left and went to Hello Betty, a seafood restaurant in Oceanside, just about a block from the ocean. They left the wall open on the ocean side and we were chilled. Bob ran back to the car to get our jackets. We split an order of steamed spiced shrimp for lunch. We left and went south on Pacific Drive until it put us back onto the Coastal Highway. 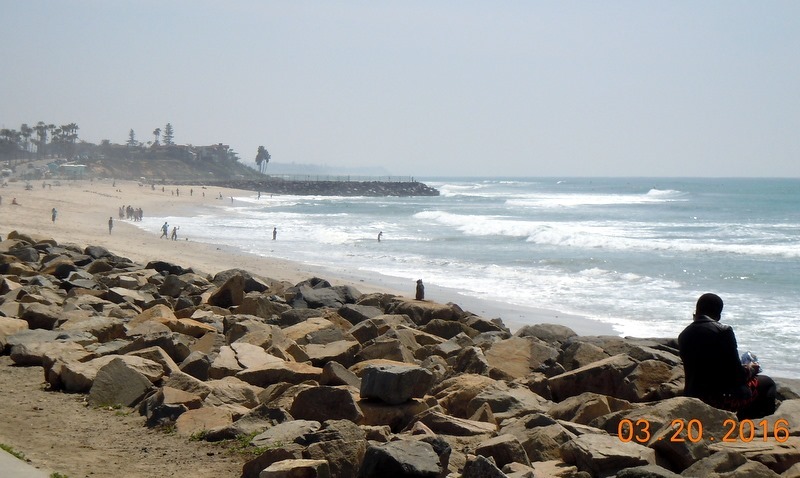 We cruised through the towns of Carlsbad, Encinitas, Solana Beach, and Del Mar. In Del Mar we stopped at the Farmers Market, where we had to find a parking place. There were not many available and we parked on a side street. This was a very nice Farmers Market with lots of different stands. A lot less jewelry, and that sort of stuff, and a lot more produce, oils, vinegars, fruits and vegetables. There were also a lot of food vendors. It took place in a school field with lots of tables, so many folks had come to eat lunch. We turned east on Hwy. 56, and took that back to I-215 to return home. 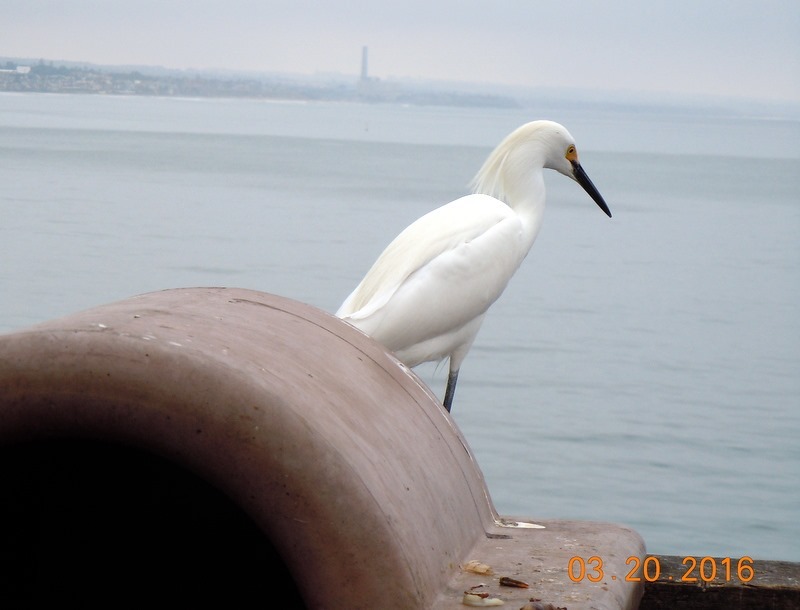 We will continue on the drive next week when we are in the San Diego area. Monday- Another quiet day at the park. I worked on articles. The weather remained decent so I went to water aerobics. It consisted of three ladies holding onto noodles and just talking so I did my own ‘thing’. We remade the bed, as they had left us two sets of sheets and towels. Again, we spent the day hanging out, riding our bikes, walking, reading. We even took a short nap. I was able to make an appointment with a mobile groomer in Jamul for the 4th, where we will be until April 6. We are still on track to pick up the MH on Friday. Tuesday- It was cloudy, cool and very windy. I worked on articles, then walked and rode our bikes, and went over to the book exchange. We turned in five books and took out four. Three for me and one for Bob. He found that he had read the book, so we are going to return it in the morning for anther exchange. After lunch, we went to Hemet to shop for some clothes. Both of us have lost weight, . I bought a new pair of smaller jeans. We stopped at Walmart and picked up a few items, then returned to the cabin. W bought gas for $2.49/gal, the least we could find. California is so much more expensive than Arizona. We read for awhile, inside, and then went to dinner at Texas Roadhouse. We each had the sirloin special, with sides and of course, their wonderful rolls with the cinnamon butter. We returned to happy dogs, watched TV, read and went to bed early. Wednesday- I sent off article #21 of 22. I had a series of articles and Part 2, was not on his list, so I had added that. I still have one to complete, but am waiting for Mark, my editor to send it to me. We left and returned to the MH. We took a short nap and read until dinner. We ate, then watched some TV. The weather has been cooler and windy. Thursday- The weather improved today. It was warmer with less wind. We ate breakfast and started laundry. This time we only had four loads, so we used all the machines. We were done by 9AM. We started a little packing and read. After lunch, I went to have a manicure. Bob took a nap. I spent time outside reading. We rode our bikes, walked and finally went to the hot tub. We grilled salmon for dinner, packed, watched TV and went to bed. Friday- Donovan from Alfateers called to let us know that the MH would not be ready until 4 PM. So we took our time. Check out was 11 AM, so we loaded the car and left at about 10:15. It takes about an hour, and lots of traffic, to get from Menifee to Fontana. We arrived and checked in with Jon and Donovan. We unloaded the cooler into our refrigerator, and went to lunch at Panera. Bob sat in the car while I went in and bought our lunches. He had to move the car when a parking place opened up. The parking lot was very full. We left and went to the dog park in Rancho Cucamonga.. We ate lunch at a picnic table. The dogs had a good time until a husky decided to attack Karlie. This is not the first time this has happened. Husky’s tend to “pack up” There were two of them, so we left. Karlie was not hurt, just scared. We went to the Fontana dog park, which does not have shade, and the dogs wandered around with some other dogs, sniffing each other’s butts. We left and returned to Alfateers. We realized that we wanted to go to Camping World, so we left and went to San Bernadino. Bob needs a new 50 spf hat, and I had gotten one there in the past. The did not have any decent men’s hats. They did have some more nice women’s ones, but I don’t need one. We also bought a collapsible bucket. I had seen it in the sale ad and we got the last one. We returned to Alfateers and sat out with the other folks, chatting and waiting. They brought out the coach at about 5 PM. It was not completed, so they are going to work on it tomorrow, on overtime, to get it done. We were able to move back in, which we did. The coach was filthy with dust from the repair. One of the things they want to do is to clean it. We unloaded some of the items from the car, then ate dinner. We continued unloading and putting items away. We sat and watched a special on PBS –The Dave Clark Five-. When it was over, we finished up some other incompleted tasks. I cleaned and we vacuumed. It is going to take a lot more cleaning!